For laboratories, research facilities, and blood and tissue banks, a pristine working environment is essential. Contamination with chemicals or biological pathogens can taint results or even endanger the safety of workers. Moore ASG can provide reliable, effective disinfection and decontamination services. Using SteraMist BIT, we can help labs to maintain a safe and contaminant-free environment. Biosafety and Biomedical Labs – Because these labs can work with some of the most dangerous pathogens, the highest degree of care must be taken. SteraMist BIT reduces the potential for human error in the disinfection process. Blood and Tissue Banks – A clean facility is vital to prevent cross-contamination of human tissues, cells, and related products. SteraMist BIT is a safe and reliable way to ensure that surfaces and equipment are clean. 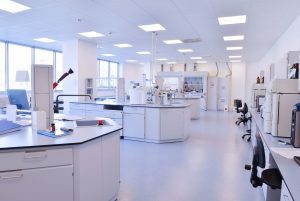 Animal Labs – Contamination in an animal lab may produce erroneous research results or endanger the safety of test animals. SteraMist BIT helps researchers maintain an environment free of bacteria, viruses, and fungi and avoid compromising the health of test animals as well as the integrity of the data collected.